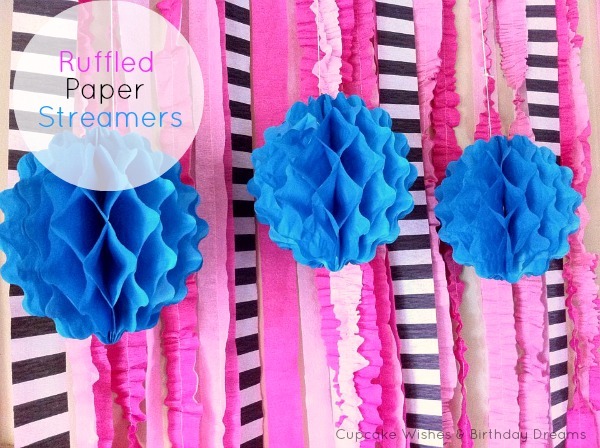 I created this ruffled paper streamer backdrop for the dessert table for my daughter's Monster High Spa Party this past weekend. I am so in love with the ruffles and frills that the backdrop is still hanging up! I thought I'd share a quick tutorial with you on how I made, what I call, a 3-layer ruffled streamer. First you will need crepe streamers, thread and a sewing machine. I used two different colors streamers, but you can certainly use three. I got my streamers from the dollar store and they held up very well in the machine....is that how you say it??? 'In the machine'...I don't sew much....moving right along.....I measured out about 3.75 yards of the streamers. This allowed me to work with the paper easier than working from the roll. Next I overlapped my two 'base' streamers and then added a lighter color on top. Next, I stitched down the center of the streamers, I didn't necessarily work in straight lines and allowed the machine to basically do all the work to gather the paper to create the ruffles. I wanted them to look a touch uneven so, I wasn't worried about them looking too perfect.....my poor sewing skills definitely came in handy! This is what the finished streamers look like. You can leave the streamers as is, or pinch along the top streamer to create a more dimensional look. 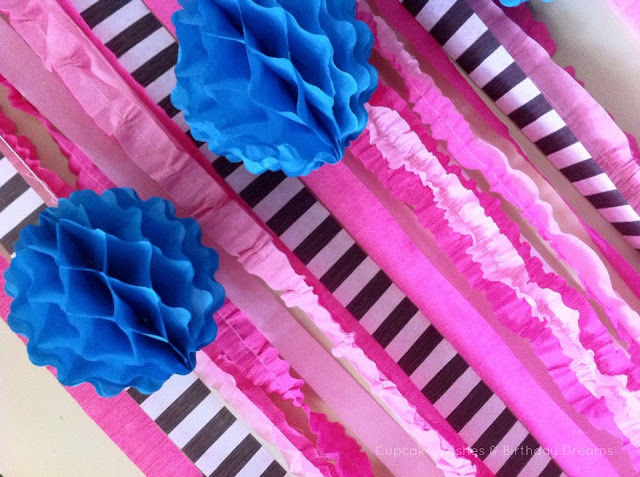 Create a whole bunch of them and mix them in with straight lengths of streamers to create a bold and eye-catching backdrop!!!!!! These came out great. Thanks for sharing the tutorial. HI. I was wondering if you used a special stitch or foot for your sewing machine? I have one that I hardly touch so any help would be great! I love the idea. I also have a super girly girl (which I love) and she is having an Olivia the Pig party and I think these will be great. Hi. I was wondering if you used a special stitch or foot for the ruffles? Just saw this on Pinterest! How cute!! Where did you find the black and white striped streamers? @Hayley Laura - I believe I got them at Party City.